Goodreads summary: "Piper, Cassidy, Mei, and Izzy have been best friends their whole lives. And they've always agreed on one goal: to get out of tiny Paris, Texas, and see the world. The school's foreign exchange program seems like the perfect escape: Piper will go to the original Paris; Mei will go to China; Cassidy will go to Australia; and Izzy, unable to afford the program, will stay at home. To add spice to their semester away, and to stay connected to their best friends, the girls start The International Kissing Club, a Facebook page where they can anonymously update one another and brag about all the amazing guys they're meeting. After all, these girls are traveling abroad: amazing guys abound at every turn! But sometimes fun, flirty vacation flings turn into more serious romances, and sometimes you don't return from abroad the same person you were. 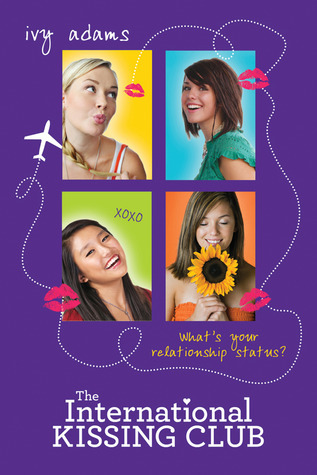 Will the girls' relationships - and their friendships - be able to survive?" I was SO ready to read a fun book after reading some disappointing ones and The International Kissing Club had me smiling while reading it! And really, how could I not, the title alone gets me in a good mood! I was expecting something light and cute and that was exactly what I got! I LOVED the dynamics in the group and the friendship these four girls had going on. Each of the girls has a well defined personality and I was never once confused by the POV I was reading from cause their voices are very clear and I knew exactly who was talking. Major props to the authors for that, cause it's definitely not always the case! Of course there were some obvious things happening and I could see some mistakes the girls made coming from miles away, but that didn't stop me from having a good time reading The International Kissing Club! All four of the girls have their own sweet lovestory and it was wonderful just delving into it. The only thing I can complain about is that with 4 different POVs, 400 pages isn't a lot and I would have liked it to be a little longer so the storylines could have been somewhat longer cause I just loved spending time with these characters so much! I'm REALLY hoping for a sequel cause I'm dying to find out what happens with all these budding romances! And just what is happening with these girls in general! It was such a cute read and definitely something to read on a nice spring or summer day! I currently have this book in my possession and you just moved it to the top of my list! I love a book that makes you smile as you are reading it. Thanks for the enthusiastic review! I really like your site blog . its look awesome and eye-catching. Thank you for the review, Daisy!